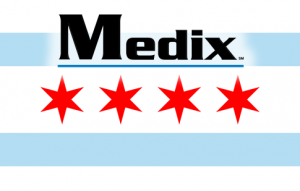 Medix’s new Chicago headquarters is opening on Monday at 222 S. Riverside Plaza, Suite 2120! I feel like Medix is leaving for college! Pre-school was the first year in our executive office space in Oak Brook, Illinois. Kindergarten through high school was a mix, moving between Scottsdale, Arizona and Lombard, Illinois – three years in Scottsdale and nine in Lombard, to be exact! Just like school, it’s the stories, learnings and relationships that matter the most, and I am incredibly proud of the team we built together. This move, this change is needed for us to raise our game to allow for the next chapter to be written about the Medix team. For me, it’s about a purposeful journey and creating opportunity! On all journeys, surround yourself with high-values-people – people who put themselves before others. Be authentically generous. Whether it’s with your time or money, be generous and look for authentic opportunities for random acts of kindness. After all, Medix’s Core Purpose is to positively impact lives! That’s why we exist. Thank you for supporting us as we begin this exciting new chapter. We can’t wait to share more stories and learnings as we grow! This entry was posted in Clients and tagged Medix Chicago, Medix Employees, Medix news. Bookmark the permalink.